Persona Non Grata: The Monarch Highway? 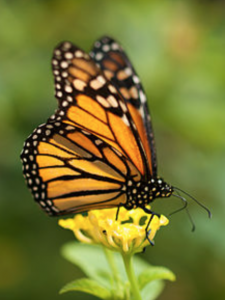 Monarch butterflies are in steep decline across North America. The causes of the butterfly's decline are a litany of the usual suspects. Habitat loss is considered the primary cause because the beautiful orange and black traveler is tied by biology to the milkweed. It only lays its eggs on the plant; unfortunately man considers milkweed a pest species and has done his worst to eradicate it using an assortment of toxic chemicals like glyphosate. The once vast expanse of diverse prairie in the nation's heartland has been permanently replaced by monocultures of corn and soybean. Locations for successful breeding are becoming fewer and far between. In 1996 an estimated one billion insects made the long migration from Mexico north to Canada. In the winter of 2013-14 only 33 million made the trip. Experts are concerned that a continued drop in numbers could put the species at risk of extinction by a single severe storm. One idea that has been suggested to help the struggling butterfly is intriguing, but far from a certain solution. 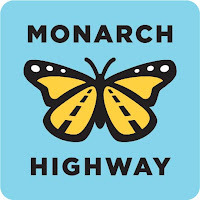 I-35 bisects the country, north to south, in the middle of the Monarch's central flight path. One of the biggest parcels of public land is highway borders, but this vacant land has been inhospitable to most insect species since it is regularly cut to the non-native roots and doused with herbicides. A plan to convert the land along the 1400 mile length of I-35 to pollinator-friendly habitat would cost between $2.8 to $5 million according to a paper put out by Chip Taylor of Monarch Watch, a conservation organization. There is no current research that supports the success of such a large undertaking. Critics point out that encouraging insects to inhabit the verges of a busy interstate highway will inevitably cause more mortality due to vehicle collisions. In the first specific study of Monarch habitat along highways, University of Minnesota researchers found 60% of studied roadside swatches contained milkweed that feeds Monarch caterpillars, but the number of larvae and caterpillars found there were lower than in prime habitat areas such as parks and backyards that contain many sources of nectar and pollen. One speculative reason for the lower fertility in roadside oases is higher levels of pollution and even noise. Nevertheless, the concept has gotten the blessing of the Federal Highway Administration and six Midwestern states. The project even has its own official logo. [left] A Monarch Highway is an uplifting idea as well as a challenging one. If it succeeds in attracting Monarchs and other beneficial insects, it will be naturally beautiful and beneficial, but it is not an entire solution. The indiscriminate use of herbicides and insistence on monocultures as means of maximizing profit has to give way to more sustainable forms of agriculture.